Staking newly planted trees should be avoided if possible. There are benefits to staking a tree, but they usually do not outweigh the consequences. During the first year after a tree is planted, it is crucial for a strong root structure to develop. Trees that are not staked but allowed to sway in the wind respond by producing roots in appropriate number and sizes to handle the wind. There are exceptions to this rule. In very windy areas it may be necessary to stake a tree. If this is the case they should be tied loosely to the stake allowing an inch or two of room to sway. Also, a wide strip of material that won’t hurt the tree should be used so as not to damage the trunk. Good materials include old T-shirts, canvas, or rubber inner tubes. Wire or other such materials can do a lot of damage if they dig into the trunk of the tree. 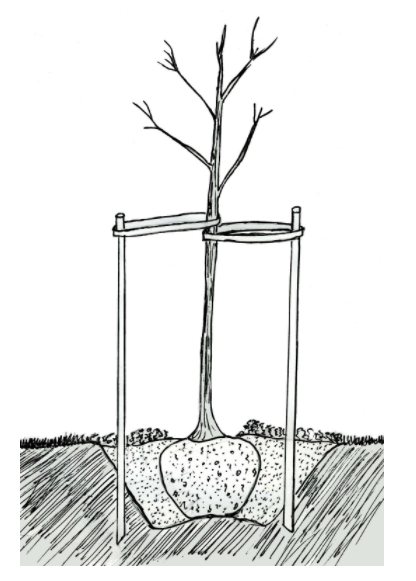 The stake should be removed after the first year to allow roots to further develop. A professional tree service will be able to help you assess your trees and stake them if needed. If are in the Las Vegas area and have questions about staking trees, contact Nevada Tree at 702-433-4700. The long term health of a tree is mostly due to the care it receives in the first year after planting. If mistakes are made in the beginning of a tree’s life it is very difficult to make up for them later on in its life. Caring for newly planted trees properly will help ensure your tree will be around for years to come. 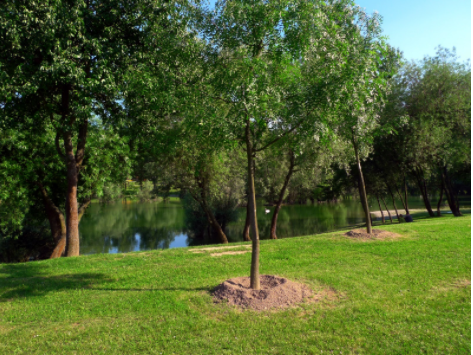 There are many things that should be avoided while caring for newly planted trees. These include staking and fertilizing, while soil testing, mulching and watering are all beneficial for trees. Pruning can be helpful but only to fix structural flaws, as the tree needs leaves to photosynthesize. Removing too many branches and leaves can hinder the trees growth. These are general guidelines. A tree service can help you determine the best methods for caring for your specific trees. If you need call Nevada Tree at 702-433-4700 with any questions.